Andrew, thanks for a log. It is something weird in your version of Android. In log is an unexpected crash. Thanks to it I found more people stuck on this and also one hack that may help here. I do not know what exactly it does, but it should work . So in next version ... thanks. This button should forward you simply to BRouter app, it do not download these files automatically. Anyway for me, this button not work as well ... fixed, thanks! Here is my way to reproduce the problem, works for me 100% in Pro and Beta version. 1. Start is to show a track from the database on the map. 2. Now tab on the track and select in “>” context menu “Route planner”. 3. Track is now open in “Route planner”. 4. 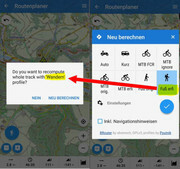 Now directly open the “Route menu” and select “Clear planner”. 5. Answer query with “Clear”. 6. Now comes the empty “Route menu”. I also had this, but I do not have a way to reproduce it. Not a bug report just for information about power saving mode of my device. @lor74cas - thanks for report - I have just bought this phone so am hoping no power saving problems with Locus. I note has inbuilt barometer - do you find the ascent measurement more accurate than a phone without inbuilt barometer? I use light filter in combination with automatic gps calibration with good results. I also use hgt files with 1 arc accuracy. 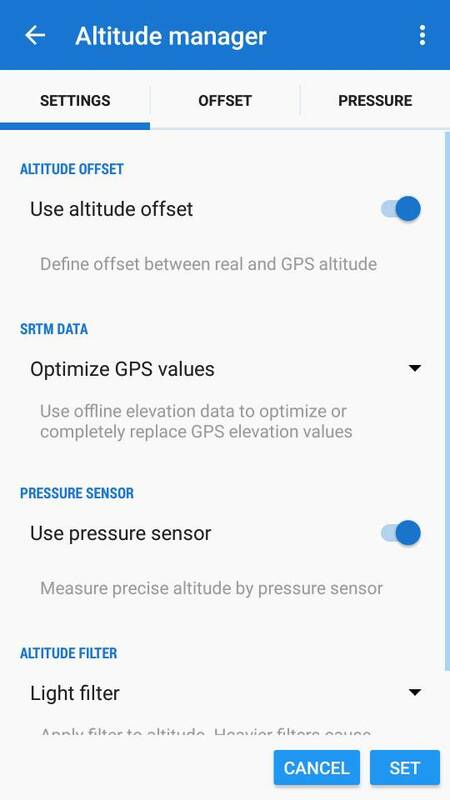 Compared to the old s5 mini it's really more accurate, but elevation seem to not be exact science: every device, every app can give you different values, now I'm happy to have values near to what expected when planning my trips. Today I tested the battery saving mode on the a5 2017 Samsung. Mid power saving mode with locus excluded from it I recorded a track. Locus was working correctly but it did not had any response from gps, I could fix a point only when watching the map so not in background. I disabled power savings without stopping the recording and all went ok. I think in this mid power saving mode only the foreground app have access to gps. Now I know it I will not use it anymore.